It’s the one new show that seems to be getting some buzz. It’s also the most talked about new show on Echo. It even has it’s own separate item, a sure sign of popularity (otherwise it would be talked about in a catch-all item like “New Shows” or something). I’ve only watched the first episode so far myself, but I’m in. 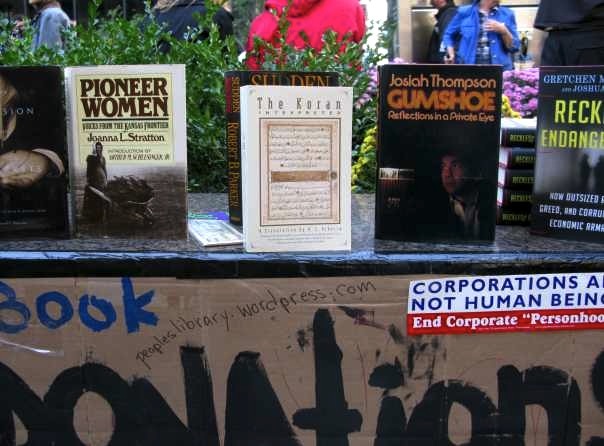 This is a shot of the lending library at the Occupy Wall Street protest. Okay, I looked to see if any of my books were there, I admit it. They weren’t. I could donate some, I suppose!